Greenhill Books is to be congratulated for reissuing this long out-of-print classic. This edition is based upon the book written starting in 1912 and first published in 1913. "This edition is reproduced now exactly as the original edition, complete and unabridged." 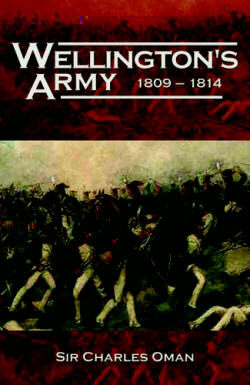 It is divided into an introduction on the old Peninsular Army and chapters on the literature, the Duke of Wellington, Wellington's infantry tactics, Wellington's cavalry and artillery tactics, Wellington's lieutenants, headquarters of the army, organization into brigades and divisions, the regiments, officers, rank and file, the Germans and Portuguese, discipline and courts-martial, army on the march, baggage and the ladies, sieges, uniforms and weapons, commissariat and spiritual life, with three appendices on regimental establishments and stations in 1809, the divisions and brigades of the army, a bibliography and with an index. To supplement the text, there are eight well-chosen black-and-white illustrations of officers and men. The appendix on the brigades and divisions contains the work of Professor C. T. Atkinson, who wrote an expanded version of his English Historical Review article on the organization of Wellington's army, listing many of the changes which occurred in the army's formations from 1809 to 1814. A very valuable tool when researching the orders of battle for its campaigns and battles. Oman tried to cover many details within this book and if you look, for example, at the subheadings for his Chapter XII on "Internal Organization of the Regiment: The Rank and File," you see such items as 'Volunteers from the Militia', 'The Normal Recruit', 'Undesirable Recruits', 'The Gentleman-Ranker', 'Concerning Sergeants' and 'The Sergeant's Self-Respect'. It was also one of the first books to discuss in some detail the Portuguese Army and its contribution to the war effort. This book is the foundation of all similar books which followed it. It was written while Oman was also working on his massive A History of the Peninsular War [reprinted by Greenhill Books 1995-1997] and Sir John Fortescue was writing his in-depth A History of the British Army. The book expands on many of the themes for which these authors were unable to do so in their larger works. Together they all provide the essential history of the British and Allied effort in Portugal, Spain and the South of France. You will find this book in the bibliography of later books published on Wellington's army as in Michael Glover's Wellington's Army in the Peninsula 1808-1814 (Hippocrene Books 1977), Philip J. Haythornthwaite's The Armies of Wellington (Arms & Armour 1994) or Stuart Reid's Wellington's Army in the Peninsula 1809-1814 (Osprey Publishing 2004). Of course as with any work first published some 90 years ago, as more recent information has become available, some of the opinions and details included in the book have been rendered out-of-date. This however does not detract from its overall quality; but, provides an interesting look at how things were still viewed more than 100 years after the Peninsular War began. It is a book which has stood the test of time and done so remarkably well.